I had the pleasure of sitting down with Christy Duncan Anderson, Executive Director of The Albertsons Companies Foundation, for a conversation about what can be the Holy Grail for many corporate philanthropy teams – moving from a program-centric charitable giving focus to one that’s truly strategy-driven. Christy shared her ideas, her inspirations and well as a few lessons learned from her 6-year tenure with the organization. CHRISTY: With 14 operating areas, the challenge for me is how do I tell a story for the entire company? To tackle that, we started by setting up impact reporting guidelines for our grantees and evaluated all the grants we made and where there were commonalities. 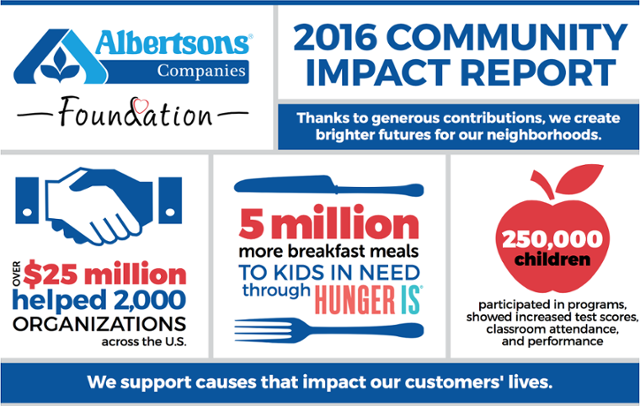 In 2016 we made more than $25 million in charitable donations and helped 2,000 organizations. We dig deep on the data to shed light on the impact we’re making. For example, we don’t just consider the overall investment in healthcare. We look at the volume of preventative tests like mammograms and the number of people enrolled in life-saving medical trials. We look for the themes and aggregate the data, making it easier to show the impact.